The first week in March we took the plunge into learning American Sign Language. We had been using signs with Sophie since she was less than a year old, but our increasing frustration was leading me to realize that we needed something more. As a three year old, Sophie has a lot of ideas, feelings, and “needs” that she wants to express, but she’s unable to do so. I can’t even imagine how frustrating that must be for her. I really don’t even know why I waited so long to start working on ASL. Maybe I just kept thinking, she’ll start to speak any time now. Well, any time is not arriving, and we are just too frustrated in this house! I remember so clearly the first Monday morning when I put on a video – Signing Time with Alex and Leah – and I sat in my bathrobe, on the coffee table, in front of the TV, with tears filling my eyes as I watched this woman, Rachel Coleman, singing and signing along, and Sophie standing there totally captivated. For the first time in a long time, I was feeling hope that I might be able to know Sophie’s thoughts and feelings and wants and needs. As we watched the first episode, I tried, through the tears, to soak in as much as I could and remember each sign so that I could continue to use them in our day. We continue to watch Rachel Coleman’s show a lot, and Sophie has come to understand that she can use her hands to communicate. 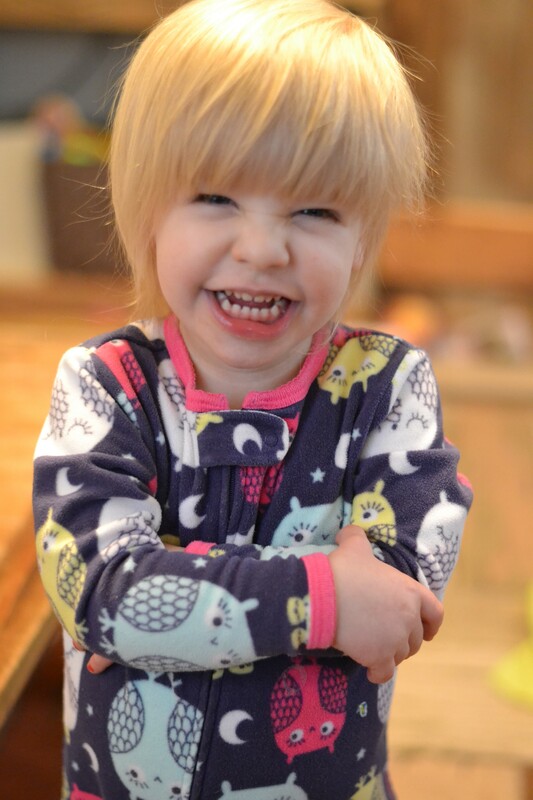 Some of her favorite signs are game, shoes and socks, sing, outside, wind, candy, school, and more or again. Finally she is able to tell me if she wants water, milk, or juice. She can choose crackers, grapes, peaches, pears, cereal, waffles, and more. She can tell me if she’s excited or if she had fun. She can tell me if she’s hungry, thirsty, tired, or grumpy. And she can tell me that she loves me. One week ago we all began the path to learning another language – American Sign Language. It has been pretty overwhelming. But Sophie is blossoming like a beautiful flower. 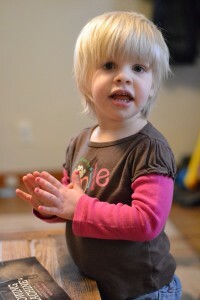 She is so much more aware of communicating with others (while she is still just three, of course). How many of you got a smile and a wave from Sophie this Sunday when she was previously oblivious to adults talking to her? I was so proud of her, even if it seemed like a small thing. Tonight my heart, my heart, she signed for the first time of her own initiative without any prompting, “I love you” to me at bedtime. After three long silent years, how completely beautiful to “hear” those precious words, those sweet feelings from my girl. Blessing the name of Jesus for how he is working in my family. How unbelievably sweet to finally be able to talk with my girl, even a little bit. While we are still overwhelmed trying to learn as much ASL as quickly as we can, we are making progress, and it is so exciting! 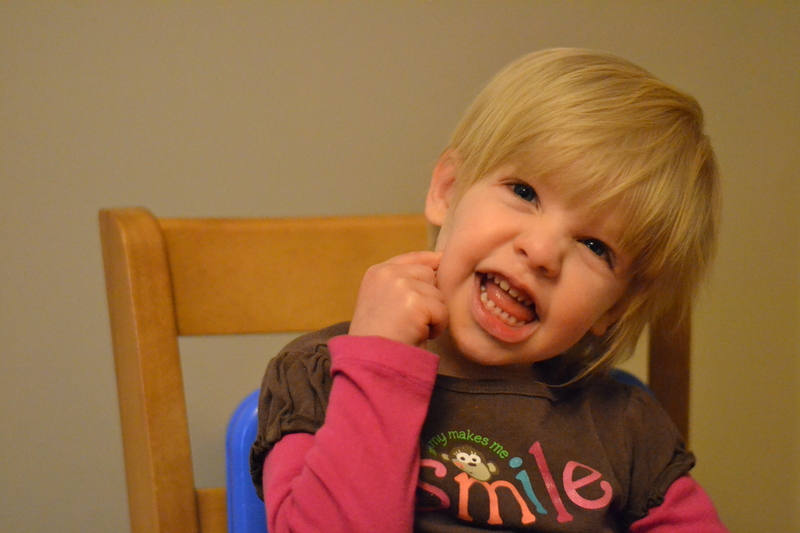 Everyday Sophie learns new signs, and she makes some up too, just like any child learning to speak. When we began watching Signing Time, Sophie probably had 5 signs fluently, and another 5 sporadically. Now we’re in the neighborhood of 30-35 signs, just four weeks later. Sophie is finally finding her voice, and it is beautiful. I cannot wait to hear more of what she has to say. I’m reminded once again that some of life’s beauty would be absent, unperceived, if we did not have to come through great struggle to see it. Keep your eyes on the horizon. Your beauty is coming. So exciting for Sophie and you mommy! Can’t wait to see your little one blossom more and more! Thank you for this update on Sophie. My heart rejoices with you over her ability to finally be able to express herself. And especially to finally “hear” her say “I love you.” Such a thrill to every momma’s heart! And my heart so goes out to you that you had to wait so long to hear it the first time! It’s totally understandable that you waited till recently to begin signing–you were being positive, holding out hope that the speaking would come in time. We mothers always hold out hope for our children. We always hope for the best for them. We mother bears do NOT give up easily. We fight to the death! 🙂 But you were wise to recognize how to “fight” right now for your girl–this new way to help meet her needs. God definitely showed you the way! I really admire you! What a challenge to learn a “foreign” language at any time, let alone with another baby to care for! You are one strong woman! And a smart one, too! What a darling she is in these pictures! Her smile is just infectious! Thank you so much Bonnie! Your encouragement is precious to me!